Introducing The Hunting Jungle – 2016SniperGame, The spookiness of the trees, the dark shadows of thewoodsjust like your nightmares, that attracts your brain creativityandclear cut imaginations is provided by the gameplay. You can aim and shoot a diverse range of wild animals likeBears,panther, wolves and many more. Hunting Jungle – Sniper 2014,2015and 2016 All you have to do is to pick a top sniper gun whichisquite the type of dream sniper you wanted when you were achild,Walk through the wild trees of the forest, aim the dangerousanimalmoving and fire it. Bang! the price will be the headshotwhich youcan boost about with your friends. The retrospect of your gaming adventure is that you havestronginterest in hunting. You enter the jungle with bestshootingsniper, you pick up your target and kill it to become adeadlyhunter. 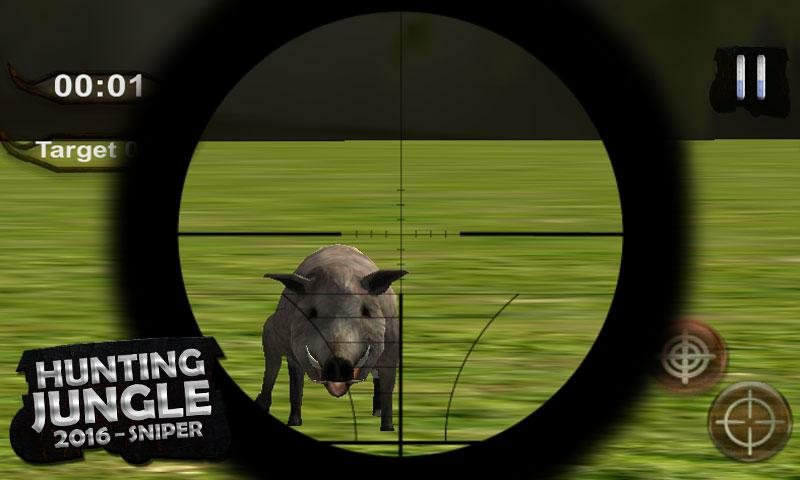 Hunting Jungle – 2016 Sniper Various levels areprovided tohunt different animal at each level. Among the best features of the game are pragmatic andterrifyingjungle surrounding, various animal target and your dreamsnipergun. In order to play, select a shooting gun; choose the wild animaltotarget like panther, bear and wolf; direct into the forest onyourphone and use the scope of the sniper to focus yourtarget. So test your quick shooting, Hunt and Hunting skills,enduranceabilities and fighting spirit by playing Wild HuntingJungle Sniper3D and become a hunting legend. ------- Best 1st Person Shooting Game Ever 100% FREE------Hello HiWelcome to Counter Terrorist GameAll to All Features Shooting Guns- special weapons● Heavy Machine guns and sub-machine guns , Squadmatches● Pistol 9mm● Ak 47● MP5● M4 rifles● Shotgun● SniperriflesMobile Game Play - Counter Terrorist Game● Realistic 3D●Trilling graphics ● Real MissionsDownload " Counter Terrorist Game" to proclaim amazing & Modern Shooting Combat Game.● Bundle ofThank for your Support and Ideas for Better Game Environment Our 1million Users Worldwide Thanks Thanks a Lot.. Introducing The Hunting Jungle – 2016SniperGame, The spookiness of the trees, the dark shadows of thewoodsjust like your nightmares, that attracts your brain creativityandclear cut imaginations is provided by the gameplay.You can aim and shoot a diverse range of wild animals likeBears,panther, wolves and many more. Hunting Jungle – Sniper 2014,2015and 2016 All you have to do is to pick a top sniper gun whichisquite the type of dream sniper you wanted when you were achild,Walk through the wild trees of the forest, aim the dangerousanimalmoving and fire it. Bang! the price will be the headshotwhich youcan boost about with your friends.The retrospect of your gaming adventure is that you havestronginterest in hunting. You enter the jungle with bestshootingsniper, you pick up your target and kill it to become adeadlyhunter. 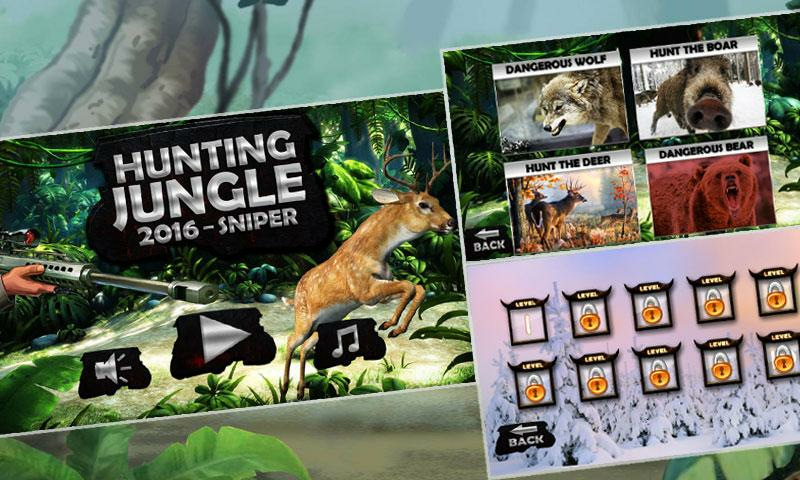 Hunting Jungle – 2016 Sniper Various levels areprovided tohunt different animal at each level.Among the best features of the game are pragmatic andterrifyingjungle surrounding, various animal target and your dreamsnipergun.In order to play, select a shooting gun; choose the wild animaltotarget like panther, bear and wolf; direct into the forest onyourphone and use the scope of the sniper to focus yourtarget.So test your quick shooting, Hunt and Hunting skills,enduranceabilities and fighting spirit by playing Wild HuntingJungle Sniper3D and become a hunting legend. Many years ago your father, last ninja warriorof the long extinct clan, waged the war of clans trying to revengefor his family! Years passed, but the battle of ninja clanscontinues, so now your time has come!Fight against different powerful opponents, crush all yourenemies and become the greatest Shadow Ninja ever with ShadowFighting Battle 3D - 2!The true Way of Ninja filled with blood, gore, and dead bodies –so, step forward without fear! Kick, punch, jump, and slash yourway to victory like a real ninja assassin! Stealth like a bat,sneak like a leopard, strike like a poisonous snake and stop thisendless Shadow War of ninja clans with Shadow Fighting Battle 3D -2!Destroy your enemies without mercy as a real shadow ninjaslayer! Use different fighting styles, attack from shadows andfight against mighty opponents! Earn points to raise up yourfighting skills or buy new strikes and punches to ensure yourvictory in the battle! Unlock new fighting arenas or even new gamemodes, beat all opponents and have fun with Shadow Fighting Battle3D – 2!The future of ninja clans depends on the power of yourfists!Shadow Fighting Battle 3D – 2 features:Second part of famous ninja fighting action game!Even more, varies ninja warriors to choose as your fighterAll-new, all-different punches, kicks, and strikes – earn points tounlock it allNew weapons and armor suits – be prepared for cruel fights!Highly detailed graphicsEnjoy the thrilling atmosphere of the oriental action game withShadow Fighting Battle 3D – 2! Are you a true Ninja Gaiden and Onimusha fan ?Do you like to holdyour katana, hash and slash all your enemies like The Last Bladeand Samurai Warriors ?Your favourite champion in League Of Legendsis Yasuo, the unforgiven ?Well, let's download and play thisgame!Samurai Devil Slasher is a sword fight survival action gamewith parry system like Dark Souls, but optimized for touchdevices.Main character is Yosuke, a daimyo in Sengoku period,similar to Mitsurugi in Soul Calibur series,on the way to find hislover, Honoka, kidnapped by devil forces.Gameplay is so simple,attack your devil, get 3 or 4 stacks and you will have ultimateattack,but hard to be master because if you hold guard button todefense from enemies attack, you still loss your HP.To no HP loss,you need to tap your guard button exactly time when enemies attacktake on your body.Fight careful and keep your character alive!YourHP is low ? Don't worry, the game have HP healing system, every 4enemies killed, you will take healing effect!Samurai Devil SlasherFeatures:- Cool main character with ponytail hairstyle- 4 stageswith three difficult levels: Normal, Nightmare and Hell- 4 bossesfrom ancient Japanese tales- Black shadow blade art like ShadowFight- Beauty Japanese graphic style with hand drawing brushcalligraphy- Falling leaves particle similar to manga and anime-Nice ultimate magic effect, included lighting storm, ocean tornadoand meteor rain ...- Amazing Japanese traditional music andrealistic sword fight sound- Lots of Northeast Asia weapons tochoose: Katana, Ninjato, Nodachi, Shirasaya Tachi, Hwando, Jian,Dadao, Zanbato- Run great on low devices- No internet connectionrequireDo you want to fight again monsters, devils to bring yourlover back?Download Samurai Devil Slasher Now! And slay them like adevil eater!Download now and don't forget to RATE GAME and LIKE ourfanpage!This app powered by ht83.com and totally free to downloadand play, all items are also free to use! Mech Robots Army Assault Wars is one kind of a play packedmultiplayer game that has ultimate iron team fighting in fungibletime! Piece together the dimensions of the humor chaos battler. Ifyou want to find out something’s that is new or special such aslove robots multiplayer battlers. It’s one of the best for you todownload to check and it has many facilities such as it is totallyfree and not costly. Mech Robots Army Assault Wars is a spiffy gamethat works to advantage and do not work poorly or haughtily. If youwish you can play the game on your android smartphone or tablet.You may find it very excellent a multiplayer game that may be givenyou confidence recons trance. At the elevated movement, the onlinemultiplayer mech automate army game on android. It can becategorically identical to the stage.The enemy battler of shadowhood has attacked & taken control over a crucial outpost namedThe Lake Base. While underestimating the power of a huge mech botsof empires, the enemy troop are unaware of the blitz anddestruction that a mech robot can cause. Your robot's named Twobitis now one of the last survivors to lay counter assault on theenemy troop. That's because other robots have been destroyed orcaptured by the militia of shadow hood inside their military base.This latest war simulator game will test your automate unkilledbattle tactics in a dangerous dungeon warzone. So follow ordersfrom the base in a crucial combat mission regicide Impossibleagainst enemy troops & attack them with a giant clash of realsteel machine!At time of war coxswain! So your mech world robot'smain mission is now to world modern combat against rogue botsstationed at The Lake base and completely obliterates rogue soldierforces at arms. You may ready to attack deceptive tacticalmaneuvers and the many hidden frolic of your emulous that have instore to you. Engage in soldier warfare with robot and destroyenemies in a global assault action deadzone. Twobit is fullyequipped mech bots with state of the art weaponry to attack thosefoe forces. Beware of shadow hood enemy counter assault forces asthey will try their best to outsmart your ultimate mech hero in anyway possible. Use the radiation missiles & shadow sniper'sfinal shot to destroy military enemy tanks, turret jeeps, armytrucks standing in a battlefield ready to out manoeuvre you. Guidethe deadly futuristic machines inside the outpost and battleagainst foe troops with your sci-fi weapons rim. Beware of opponentcombat soldiers nation ready to bring the giant action worldwarlords down. Demolish the rogue robots and seizure the signalseized, and then upgrades your arsenal to promote combat strength.Velocity and stability of your better bot. To prove yourself inevery chart, you must use various artfulness and method to emergeexultant from battle.Robots Army Assault Wars 2k17 Legends KeyFeatures:- Smooth Graphics & Pacific 3D Animation give realwarfare experience!- Melodious Sound quality, soft game control& Destruction!- Realistic 3D Robot to attack enemies.- VariousMissions to destroy enemy military!- complete military tasks forbonuses and earn the Best mortal battle title- Modern MilitaryEnvironment with Battle Tanks, Army Trucks & Assault Forces!-Enjoy Completing Military Missions with your Robots!So, PlayPortable Assault Wars, the latest among robot games & overkillfighting games. Playing robot battler games would be a super funfilled experience for you by playing this latest battlefield actiongame. Enjoy & get the best robot fighting experience!! Call ofcritical strike black ops & army! Win is yours!! Download NOW!! If you are interested in Forest Hunting, Then get ready for thisForest Hunting game. An exotic hunting simulation: Choose yourfloresta Sniper gun and hideout in forest so during wild animalhunting your enemies (wild animals) not get noticed of yourpresence in this hunting game. Whether you want to hunt lions,cheetahs, tigers, Stag, Deer or Bear, this wild hunting game givesyou all, and invites you to take the challenge if you can prove tobe the best in hunting jungle animals in floresta. Forest huntingis not easy thing in real life and especially in the forest(jungle) among wild animals that can kill you. Be aware ofdangerous and wild predators while aiming on all kinds of animalslike Hippo's, Lions, Crocodiles, Sheep's, Goats, Deer's, Stags,Zebra's and many more!This forest hunting game offers you theunique wild animal hunting game where you can hunt a lot of wildanimals, just aim and shoot. As animal Hunter this hunting gamelets you hunt the biggest and most dangerous animals in the junglefor example tiger hunting, Cheetahs hunting, Elephants and Lionshunting. 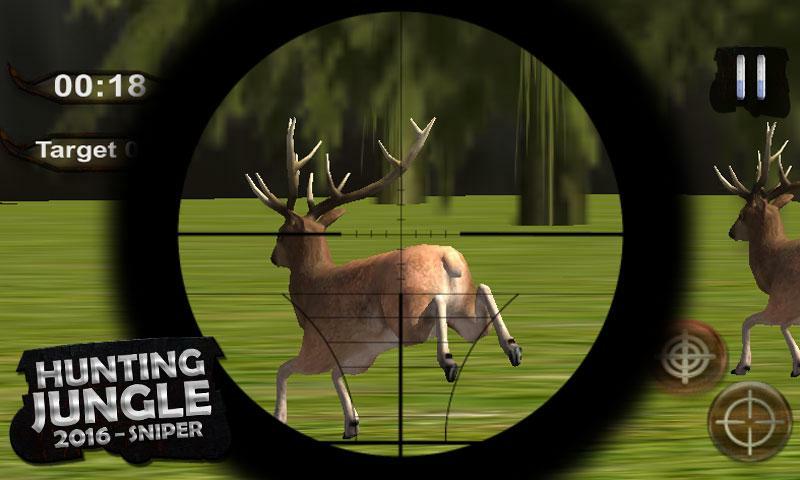 This animal hunting game gives opportunities to wildhunter to hunt deer in real wild hunting atmosphere. in thishunting game you can unlock new snipers handguns, shotguns and evenautomatic weapons in the weapon store! 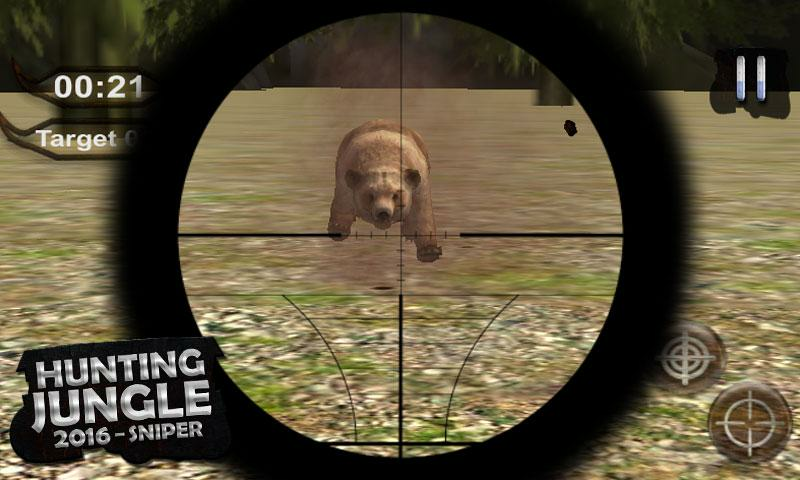 In this animal hunting freegame, be part of the real hunter simulator and reach your huntingjungle animals venue first, choose target, aim and shoot the wildanimals.The forest is full of wild animals so you will have to putall your animal hunting and tiger hunting skills to practice to bethe best hunter. 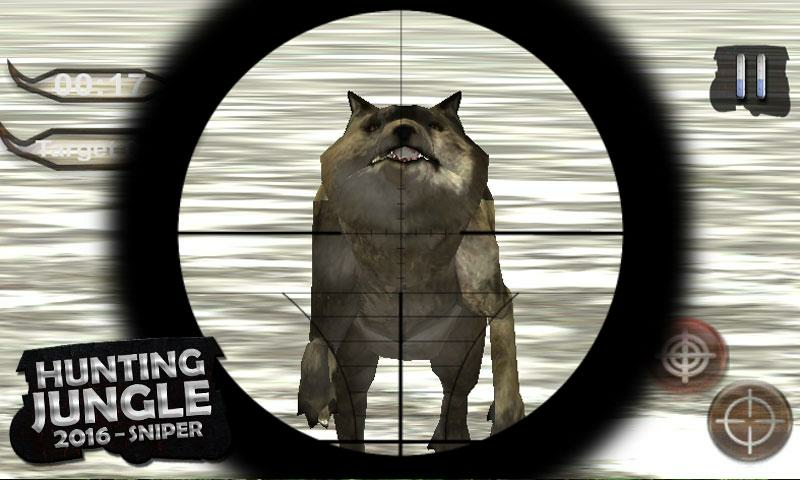 In this Forest Animal Hunter free game you canperform exception sniper hunting and make your hunting day full ofenjoyment.Game features:-- Totally FREE to play.- Unlock all kindsof weapons.- 20 levels with all a different difficulty.- Cool 3Danimal animations and simulations.- Maybe you win a cool trophywhen you finish the game!- User friendly and easy to control.-Realistic forest environment .